I used to drive by the yellow striped awning of "Lemonade" in West Hollywood and wonder, How can a business survive on lemonade alone? Only when I ventured inside did I discover there was more to the tiny, tucked away eatery than just the tart, sugary nectar of its namesake. 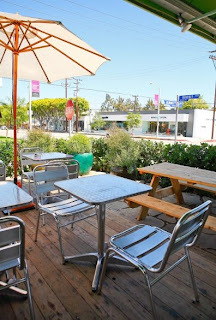 Situated on the corner of Almont and Beverly Blvd, Lemonade looks like a cheerful little abode from the outside. There is a roomy wooden deck patio set up out front with tables, umbrellas and chairs where the bulk of the “for here” dining takes place. 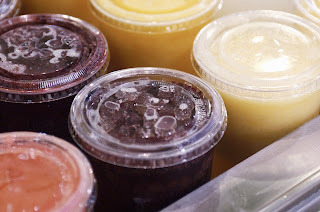 The interior of Lemonade is a sunshiny feast for the eyes with bright yellow walls, buckets of sunflowers sprinkled about and a rainbow of multicolored lemonades whirring around in large glass dispensers. Maybe it was the bakery case filled with delectable treats like lemon bars, mini meringue pies and cupcakes or the variety of succulent salads neatly displayed in white trays, but I found it hard to contain my glee. This was destined to become my new favorite lunch spot. Part lemonade stand, part school cafeteria, this place made me feel as jubilant as a kid without a care in the world. Proteins on the left and side salads on the right. These tempting desserts are located right by the register. Goodbye will power. When I was finally able to focus on the food, it was nearly impossible to make a decision. I knew I was getting the mac and cheese from the steam tray but felt it prudent to sample some of the fresh salads and of course finish off with dessert. Oh, and they have sandwiches too. I first chose the Salmon Salad which is qualified on the menu as a "protein." When you order a protein, you get two side (non protein) salads. Each salad is two scoops but you can opt for half a scoop. Sound confusing? As I tried to wrap my head around the system, I settled on a side of Snap Pea Salad and a side of Arugula and Strawberry Salad. Right, and the side of mac and cheese ($4.50). It was way too much food but all in the interest of good journalism. With so much wonderful build up, it breaks my heart to report that the mac and cheese may be the worst I’ve reviewed to date. First of all, the elbow macaroni noodles were overcooked and mushy, a side effect of sitting in a heated steam tray all day, I suppose. The sauce, a mixture of Cheddar and possibly Parmesan was terribly bland and erred on the side of too much béchamel. One of my lunch pals, Alycia said, “It tastes like a frozen Weight Watchers version of mac and cheese.” That can’t be good. The texture was reminiscent of hot breakfast cereal, which might appeal to a toothless person or a toddler but anyone else would be better served avoiding it at all costs. Strawberry, Arugula and Gorgonzola Cheese Salad, Snap Pea Salad and Salmon Salad. But here’s the good news; everything else we ate and drank was delicious. It’s obvious mac and cheese is not the star of their show but plenty of other items are worth the trip. Ahi Tuna, Tomato and Avocado Salad, Red Velvet $1 Cupcakes, Mac and Cheese and Lemonade. Salmon Salad on the right, Israeli Truffle Cous Cous and Orecchiette Salad on the right. The Salmon Salad, an alternative to tuna salad, was prepared without mayonnaise and tasted light and slightly sweet. A couple of my lunch pals, Alycia and Angie had Truffle Mushroom Israeli Couscous with Parmesan that tasted nutty and fantastic. The Tomato and Avocado Salad sampled by Carol and Angie was seasoned with citrus and turned out to be a big hit. All the ingredients were fresh and the portions enormous as you can see in the photo. And even though I spilled some of the Blueberry Lemonade on my white pants, it was berry yummy. Offering four different varieties a day including exotic mix - ins like blueberry, cucumber and mint, this lemonade is the real deal, tangy and delicious. On to dessert. I thought there must be a catch when I saw the $1 price tag on the cupcakes but no, they are just that affordable. My posse sampled the Red Velvet, Chocolate/Chocolate, Carrot and Pumpkin and the verdict...best $1 ever spent! 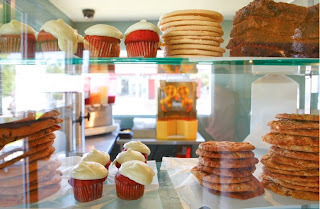 The cupcakes, all moist with creamy frosting, are a little smaller than one might find at Sprinkles or some of the other gourmet cupcake shops around town but I found the portion to be the perfect size, about two to three bites each. There was, however, one voice of dissention in the crowd regarding the cupcakes and that was Jessica. She thought the red velvet frosting was a little too wet and prefers a stiffer frosted peak on her cupcake. Again, it was only $1. In conclusion, I heart Lemonade but only the one in WeHo. I made the mistake of checking out the downtown location and was thoroughly disappointed with my findings. Unlike the euphoria I felt in the bright airy WeHo location, the downtown version, located in an underground food court, made me feel like I was stuck in a dreary airport. It lacked the brightness and cheery vibe of Beverly Blvd shop even though all the food offerings are the same. I tried the mac and cheese there too and guess what? It still sucked. Such a bummer. They are just about to open a new location in Venice and fingers crossed it is more closely modeled on the WeHo locale. We'll be down in LA on business in a couple of weeks..gonna have to try Leomonade..if I can stay away from Sawtelle Kitchen and Beacon. It loook great? Is that the corner where Buddahs' Belly used to be? You'll love Lemonade! Get that truffle cous cous if they have it. It's on Beverly just east of Doheny and west of Robertson. I thought the neighborhood was Beverly hills but the website says it's West Hollywood. Go figure. Thanks for visiting the site! All these videos were really interesting for me to watch them literally every single time that you have shared. They are good to entertain you when you are looking for the real time entertainment.